Cameron Smith has outlasted Jordan Zunic as they engaged in a 20-hole encounter for the Australian PGA Championship at Royal Pines Resort on the Gold Coast. Smith overcame a three hole deficit to force the play-off to eventually win with a par on the second extra hole. Earlier Smith nailed a birdie on the 17th to head down the last with a stroke lead over Zunic but made a mess of the last with a bogey seeing the pair finishing at 18-under. Both players parred the first play-off hole before Smith executed a superb chip from off the green to set up a 2-metre putt for the victory. Earlier Zunic had finished short of the green but managed to get his approach to within 3 metres. 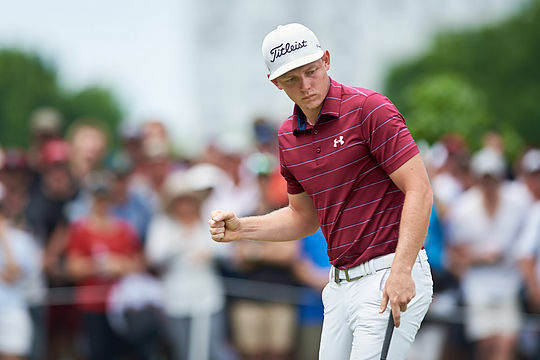 Zunic’s putt lipped out while Smith made no mistake the second time around to earn his first professional win in Australia and second overall after collecting the Zurich Classic teams crown on the PGA Tour in New Orleans in May. The Australian PGA title is Smith’s first individual win as a professional and was also secured in his home state. Professional sport can be brutal as Zunic found out after coming so close to getting the kick-start he needs since winning the New Zealand Open in 2015. A victory would have given him a two-year European Tour exemption alongside the winner’s cheque of nearly $240,000. For the immediate future Zunic has status on the Australasian Tour, but the display the Wollongong native put on over this weekend is indicative of his talent and doors are bound to open for him moving forward. “I just tried to keep doing what I’ve been doing the last four days,” said Zunic, 25, who also won the Northern Territory PGA Championship back in August. South Australia’s Adam Bland completed a solid week of golf to finish one adrift of the leaders, while Marc Leishman surged with four late birdies to finish fourth at 14 under. The Final Order of Merit on the Australasian Tour was taken out by Brett Rumford, who topped the moneylist with A$313,094 while Adam Bland finished second with A$292,570. Rumford will receive an invitation to The 147th Open Championship as well as the WGC – Mexico Championship and the WGC – Bridgestone Invitational. Bland came agonisingly close to securing the title, needing to finish with outright or shared second place today rather than third – a difference of just one shot.